Assisted by the North Brevard Heritage Foundation, Brevard County received a $350,000 Special Category Grant for historic restoration from the Florida Historic Commission in 2006. Funding provided much needed resources to start priority work, which was identified by an assessment architect. An additional $80,000 was appropriated by the Brevard County Commission to begin the stabilization of the house. CLICK for a gallery of photos of the restoration progress in 2009. 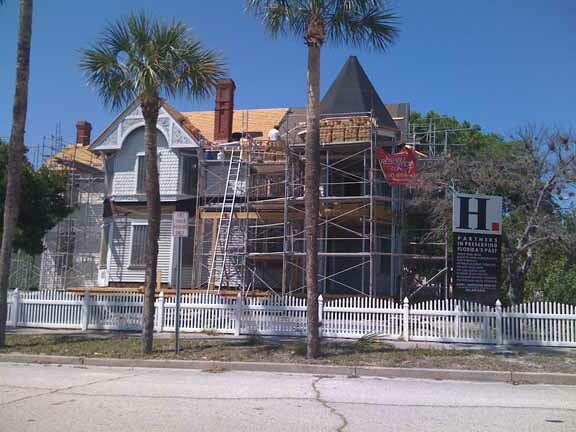 Historic restoration is not "just another construction job!" Special knowledge and skills are required to ensure that historic replication and restoration methods are done properly. Restoration work was undertaken under the direction of Kenneth Smith Architects, Inc., a historic restoration architectural company, in compliance with The Secretary of the Interior's Standards for Rehabilitation and Guidelines for Rehabilitating Historic Buildings, with necessary modifications for building code and ADA (Americans with Disabilities Act) compliances. The majority of restoration work was accomplished between 2006-2010. FLOORING & WOODWORK: The heart pine tongue and groove flooring (with few exceptions) and woodwork are original and have been refinished. NBHF Volunteers aided in cleaning and staining doors and woodwork. Vintage heart pine flooring salvaged from other structures by NBHF volunteers, has replaced other flooring materials in the kitchen, hallway between kitchen and dining room and upstairs bathroom. WINDOWS & SCREENS: Most of the windows are original, many with original glass panes. They are weighted and operate on cords and pulleys. Window screens are half screens that run on wood slides approximately _ inch wide, located on each side of the window frame. Each corner of the screen has a decorative embossed metal corner bracket. NBHF volunteers repaired window screen frames and hardware, re-screened with copper screening and re-installed, repaired and re-corded windows, scraped and painted exterior window frames. DOOR HARDWARE: Door hinges, key plates and pins are original decorative embossed metal. The door knobs with back plates and locks are original and have been restored by NBHF volunteers. Most of the original skeleton door keys have been retained and are usable. ORIGINAL LIGHT FIXTURES: Four original light fixtures are still in the house, and three are ceiling fixtures made of "roped" brass. One is the fixture in the entrance hall with its original etched glass shades, another is a hanging fixture in the maid's bedroom with only the bare light bulb, as seen today, and the third is in the ceiling light in the dining room china closet. An original painted metal wall-mounted fixture and glass shade remains on the north wall in the master bedroom. All have been rewired and restored. Other vintage lighting fixtures have been donated and/or purchased by the North Brevard Heritage Foundation. FIREPLACE MANTELS: The fireplace mantels were removed, cleaned and refinished by a local antique restoration company with funding provided by a Quester's International organization historic preservation grant. ADDITIONAL ELEMENTS OF INTERIOR REHABILITATION INCLUDED wall and ceiling repair and re-plastering, installation of new electrical wiring & plumbing throughout the house, wall and under floor insulation and other miscellaneous work items as described. FIRST FLOOR consists of the main entrance hall, stairway to second floor, parlor, dining room, kitchen & stairway that ascends to the maid's room, and a latticed back porch. ENTRANCE HALL: You enter the house into the main entrance hall through the original double front entrance doors that have frosted glass window panes etched with the letter "P". An ornate fireplace mantel with tiled hearth flooring is in the southwest corner. The stairway to the second floor features a newel post with built-in light fixture. An original 3-armed brass roped lighting fixture with frosted etched glass globes hangs from the ceiling and has been rewired. THE PARLOR: Entrance is through two large sliding pocket doors with original decorative metal hardware. A mirrored oak fireplace mantel is accented with colorful tiled hearth flooring. Original wallpaper was deteriorated on the ceiling and walls of the parlor and removed to install electrical wiring and repair and re-plaster damaged walls. Samples of original wallpapers are archived for future reference. THE DINING ROOM: A fireplace with a simpler mantel design and tiled hearth flooring is located to the left of the doorway. There are two closets on the north wall, one was used as "china closet" and the other as a pantry. A hallway (which no longer exists) was located north of the dining room and served as a passageway between the kitchen and parlor to avoid going through the dining room and for storage. This area was converted to house the downstairs A/C HAVC unit and ADA-compliant bathroom. THE KITCHEN: It was originally separated from the main living area by an open passage on the ground floor that ran north to south. Shortly after the house was built, it was closed in with an entrance door on the south side and a window on the north side. A narrow stairway ascends from the kitchen to the maid's room above. Originally there was a pitcher pump and dry sink on the north wall of the kitchen, pumping water from the cistern located on the north side of the house near the kitchen. A large sink was installed with the advent of running water in the 1920's, and has been refurbished. There were no built-in cabinets in the kitchen and a work table was under the west window. Custom cabinets were built and installed using the small corner cabinet as a model. A chimney flue cover for a cook stove is still intact on the west wall. A single light bulb hung from the ceiling and original knob-and-tube wiring can be seen on the kitchen ceiling. The original latticed porch located on the west (back) end of the house provided privacy and was a place to do laundry. It has been refurbished with new porch flooring and roof. 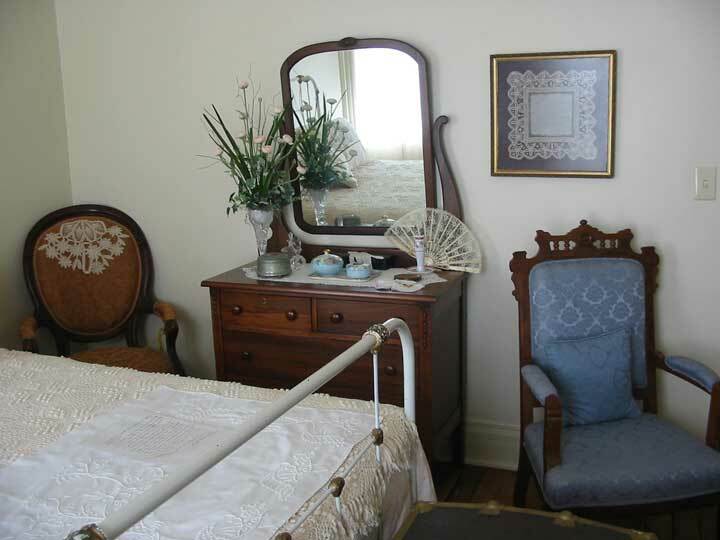 SECOND FLOOR consists of four bedrooms, the maid's room, and the original bathroom. BEDROOMS: Both the master bedroom and south front bedroom have doors that open onto the outdoor balcony. Notes on the original plans show that a window in the front south side bedroom was changed to a door. There are built-in closets with original shelving and clothes hooks in all bedrooms. The master bedroom has the only fireplace on the second floor and was bricked up while Captain Pritchard was still alive because it did not have a good draw, causing smoke. The embossed metal maid's bell is still mounted on the wall in the master bedroom. The other bedrooms were heated by wood stoves as evidenced by flue covers, except for the bedroom on the north side of the house which had no means of heating. The closet in this bedroom also houses the A/C HAVC unit for upstairs. MAID'S ROOM: This room is the only upstairs room that is located on the west (back) side of the house, next to the upstairs bathroom, and is accessible by a narrow steep stairway that goes down to the kitchen. It was used by family members as a sleeping and later a storage room. An original roped brass light rod hangs from the ceiling with a single lightbulb at the end and has been rewired. ORIGINAL BATHROOM: This is in the passage between the main house and maid's room at the west end of the hallway. Prior to the installation of running water, a pipe and hand pump were located next to a copper bathtub, to pump water from the cistern into the tub. The small pipe hole, located under the window on the north side is still visible. The iron clawfoot bathtub, sink and rare six-pronged handle faucets date back to the installation of running water in the 1920's and have been refurbished, the toilet is new. STABILIZATION was the first course of action. The house was jacked up and placed on steel beams, while new concrete footings were poured, and piers were rebuilt, using a mixture of new and old bricks. The house was then lowered, strapped to the piers and leveled. ROOFING SHINGLES: After removing several layers of asphalt roof shingles, original weathered heart pine shingles were exposed. Stamped on the back of some of the old shingles was "Gaulden Lumber Co. 3x18 hearts, Maytown, Fla." Samples of these original "bundle board" shingles have been preserved and are displayed in the archive room. To restore the roof to the natural beauty and architectural grace of an authentic wood shingle, the architect chose a specialty shingle made of pressure-treated pine, with a high solar reflectance and high R-value rating, a wind resistance rating to 150 mph, maintenance free, rot, decay & termite resistant, and highly durable with a 50-year warranty. STOP GUTTERS, GABLE FINIALS, & CHIMNEYS: Historic photos showed that "stop gutters" were originally on the roof. These were replicated and installed as part of the roofing system, along with copper downspouts. Historic photos also revealed that finials were originally on the south and east roof gables. Measurements were calibrated from the historic photos to provide architectural drawings for replication. During selective demolition of the turret roof, the finial was removed and found to be a one-piece hand-turned log approximately 4 ft. long. The reproduction finials are hand-turned and made of "sinker logs", which are aged, fallen red cypress trees salvaged from the wild. The brick chimneys were repointed with a special mortar mix and colored to match existing mortar and new flashing was installed at each chimney base. PORCH RESTORATION: The City of Titusville awarded the project a Faḉade Grant with a Community Redevelopment Agency (CRA) matching grant of $40,000 to complete the porch restoration and install an ADA-compliant ramp. The deteriorated porches were rebuilt, with new engineering and construction for the porch framing. Steel posts, which are strapped to the railings, provide extra support, with replicated porch columns wrapped around them. Porch restoration included replacement of bead board siding on the inside porch walls and ceilings, and new tongue and groove flooring on the first floor. Salvaged bead board was used when possible, and most of the porch ceiling was kept intact. Small square boxes called "scuppers" were hand fabricated to fit through the walls of both porches to allow water that collects on the porches to drain. SECOND STORY PORCH FLOOR: Analysis revealed that the original flooring was tongue and groove pine wood flooring, covered with painted canvas fabric, a common construction method of the day. At a later date, metal panel flooring had been installed and covered with a painted canvas fabric. For restoration, current existing building codes forbade re-installation of a canvas floor covering over metal, so a metal deck flooring resembling the earlier installation was selected for the floor surface. The interlocking metal panels were installed with clips and hand-soldered to lock the metal panels together. The life span of this durable floor, which also serves as the roof to the first-floor porch, is approximately 70 years. PORCH CEILING LIGHTS: Porch ceiling light fixtures that matched the original iron mounting on the second story porch light were purchased from Barn Light Electric Co. in Titusville. Click to see enlargements with description. SHUTTERS: Fifty-four of the sixty-three exterior handmade cypress shutters are original and have been repaired and reinstalled by NBHF volunteers. The frames are mortised and held together with hand carved wooden pegs. The louvers are made with small pegs notched out on the ends of each louver to hold them in the frame slots. The shutters are hinged to be opened and locked into place, or when closed are secured by a hook and lock system inside the window frame. Nine of the original shutters were deteriorated beyond restoration and were replicated and reinstalled. Shutters are various sizes to fit individual windows and divided into 3 and 2 sections. Most of the shutter hinges and locks are original and some replacements are replicated. FISH SCALE CYPRESS SHINGLES were hand cut and are approximately 18 inches long and tapered on one end. 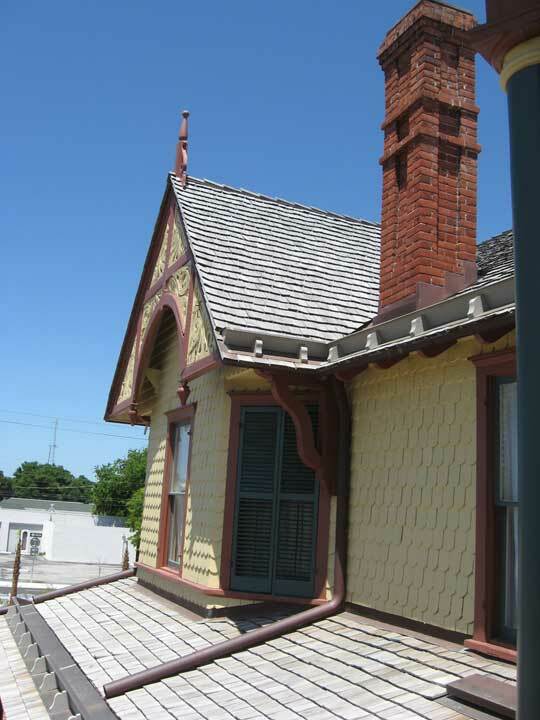 Most of the original fish scale shingles were left in place or reused and replacements were replicated. VERGEBOARDS, FINIALS & SCROLLWORK: Original vergeboard scrollwork inserts deteriorated beyond repair and have been removed. Most of the original nine hand-turned vergeboard wood finials were deteriorated or missing. One original finial has been used to replicate replacements. Both vergeboards will be refurbished, the scrollwork replicated, and finials installed. 1. Family oral and written documentation. Written documentation by Fannie Budge Waters, who was born in 1891 and lived in the house in her youth from 1896 - 1910, recalled the house as being painted white, trimmed in several colors of green. Mary Pritchard Schuster, who was born twenty-three years later, in 1914, recalls the house being a cream or more of an ecru color, trimmed in russet brown with dark green shutters through her teenage years. She colored a sketch of the house to show where colors were located. 2. Newspaper articles and photographs. Early photographs suggest that the house exterior was not painted in the year it was built, in 1891. Early black and white photographs were used to determine placement of dark and light colors at various periods of time. 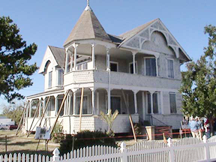 A newspaper from 1895 stated that Captain Pritchard was painting the house a darker color that year. 3. Paint scrapes on the house revealed evidence of original colors. Paint scrapes revealed that the porch posts were dark green, and post caps and bases were russet brown, as were the trim boards. Fish scale shingles revealed that they had been painted mustard yellow. This was determined by evidence of this color being present under the face boards that cover the fish scale shingles, and when the fish scale shingles were separated this color was found impregnated into the wood. Photos show the posts were a dark shade, with paint scrapes revealing dark green. Although most of the shutters were later dark green overall, physical evidence showed us the shutter louvers had once been painted mustard yellow with the frames being dark green. At the start of restoration, the second-floor porch still had most of its original posts, bases and caps. Some photos showed these post caps and bases as light in color but paint scrapes on them revealed they had formerly been russet brown, as were the trim boards. 4. Color meter readings by Benjamin Moore Paint Company Representative.